Draft: 2001, Boston Red Sox, 8th rd. October 31, 2013 New York Yankees activated 3B Kevin Youkilis from the 60-day disabled list. July 7, 2013 New York Yankees transferred 3B Kevin Youkilis from the 15-day disabled list to the 60-day disabled list. June 2013 back surgery. June 14, 2013 New York Yankees placed 3B Kevin Youkilis on the 15-day disabled list. Lumbar strain. May 31, 2013 New York Yankees activated 3B Kevin Youkilis from the 15-day disabled list. May 29, 2013 New York Yankees sent 3B Kevin Youkilis on a rehab assignment to Trenton Thunder. December 14, 2012 New York Yankees signed free agent 3B Kevin Youkilis. 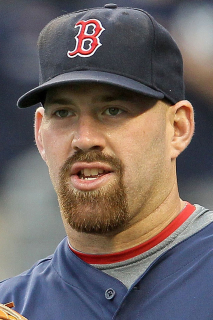 November 3, 2012 3B Kevin Youkilis elected free agency. May 22, 2012 Kevin Youkilis roster status changed by Boston Red Sox. May 16, 2012 sent 3B Kevin Youkilis on a rehab assignment to Pawtucket Red Sox. May 1, 2012 Kevin Youkilis roster status changed by Boston Red Sox. September 2, 2011 Boston Red Sox activated 3B Kevin Youkilis from the 15-day disabled list. August 30, 2011 sent 1B Kevin Youkilis on a rehab assignment to Pawtucket Red Sox. August 18, 2011 Boston Red Sox placed 3B Kevin Youkilis on the 15-day disabled list. Sore back. November 8, 2010 Boston Red Sox activated 3B Kevin Youkilis from the 60-day disabled list. September 13, 2010 Boston Red Sox transferred 1B Kevin Youkilis from the 15-day disabled list to the 60-day disabled list. August 3, 2010 Boston Red Sox placed 1B Kevin Youkilis on the 15-day disabled list. Right thumb adductor muscle tear. May 20, 2009 Boston Red Sox activated 1B Kevin Youkilis from the 15-day disabled list. May 18, 2009 Boston Red Sox sent 1B Kevin Youkilis on a rehab assignment to Pawtucket Red Sox. May 12, 2009 Boston Red Sox placed 1B Kevin Youkilis on the 15-day disabled list retroactive to May 5, 2009. Left oblique strain.